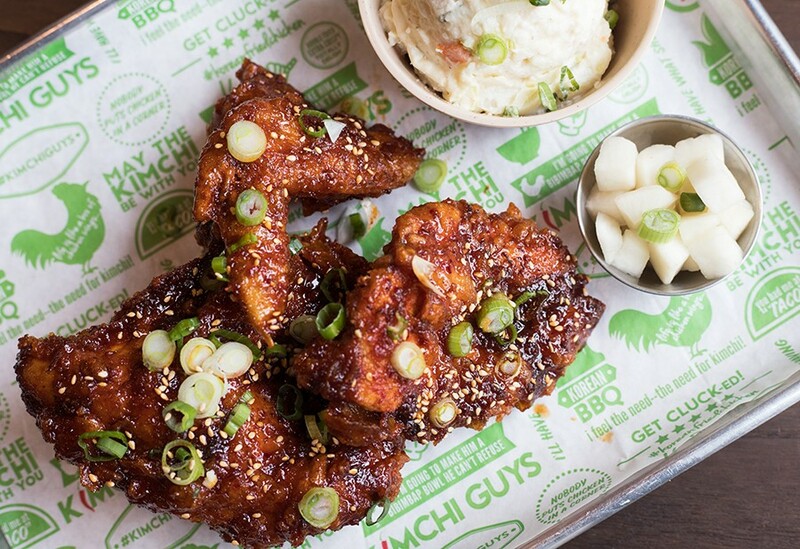 Kimchi Guys’ highlights include Korean fried chicken, bibimbap and soju. 612 North Second Street, 314-766-4456. Mon.-Sun. 11 a.m.-8 p.m.
On a clear day in the summer of 2015, Munsok So was working, per usual, at his corporate offices inside the Cutlery Building on Laclede's Landing. So had bought the historic building nine years earlier, using it as the hub for his restaurant company, So Hospitality Group. He was bullish on Laclede's Landing. His flagship brand, Drunken Fish, ran out of the building's ground floor, as did his nightclub, XES. So's duties kept him so busy that he typically worked through lunch. However, on this day, after a friend unexpectedly stopped by, he made the fateful decision to go out to eat. The pair were just settling into their meal when So got the call: The south wall of the Cutlery Building had collapsed. The entire wall. It was so catastrophic that the conference room chair So usually sat in had been left dangling in the air, four stories above Second Street. 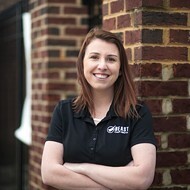 For many people, a near-death experience and catastrophic building collapse would have been a sign to cut their losses. But So isn't like most people when it comes to the Landing. The restaurateur had expanded the Drunken Fish to the riverfront district in 2006, a time when the area's reputation as a bar-hopping hotbed and tourist trap was already waning. He saw promise in the Landing thanks to the casino development at its north end and decided not only to open his third Drunken Fish there but to buy its building as an investment. Owner Munsok So, best known for Drunken Fish, never gave up on the Landing. Then came the 2008 financial crisis, which halted development around the casino and the Four Seasons Hotel St. Louis. 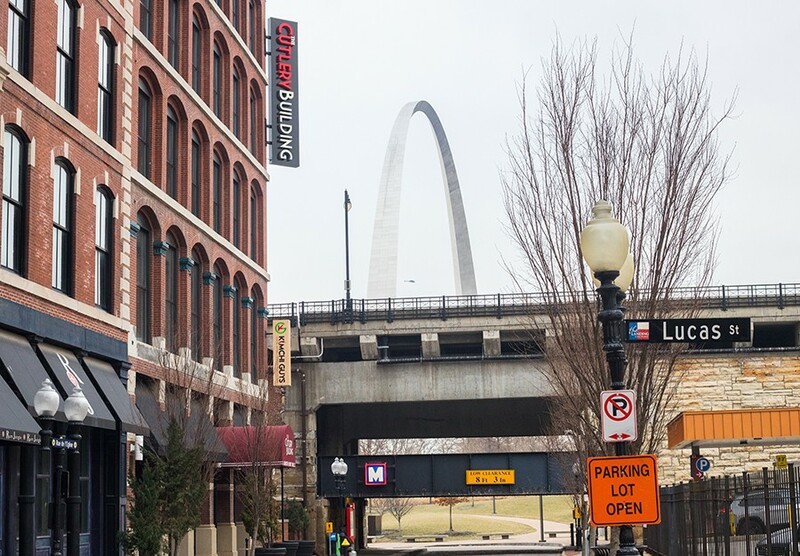 Renovation of the Arch grounds, which began in 2013, only added to the Landing's plight, rendering the district a ghost town beyond a few businesses hanging on by a thread. So, it seemed, had placed a losing bet. The building collapse gave So an out, if he wanted it. He could take the insurance money and move on, or even replace the wall and rebuild Drunken Fish, returning to business as usual. Instead, he saw the situation as an opportunity to think even bigger. He hatched a plan to help people rethink what the Landing could be. One part would involve transforming the space into a stunning events venue with some of the best views in the city. Another component would be a coffee shop to serve the neighborhood's growing workforce. 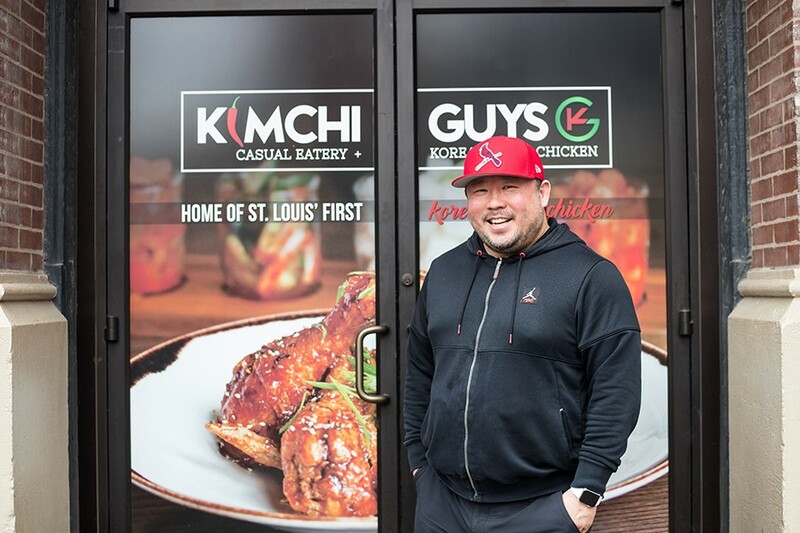 And for his pièce de résistance, So would open Kimchi Guys, a Korean fast-casual restaurant serving up some of the best chicken ever to pop out of a deep-fryer on either side of the river. Kimchi Guys only opened in February, but already the restaurant has the feel of a concept poised for replication. Eye-catching vibrant green branding unites the employees' hats, the menu board and the paper that lines food trays. The stylish space exudes that familiar fast-casual look of cool industrial touches juxtaposed with exposed-brick warmth. The majority of the real estate is comprised of the order counter and an open kitchen where cooks prepare each dish to order. 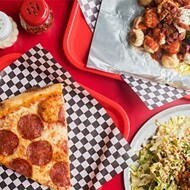 This can, at times, result in a slightly longer ticket time than other fast-casual restaurants; cooking fried chicken, after all, takes longer than dishing pre-made food out of a steam table. Still, it's well worth the five minutes or so that it takes to get your food. Seating is limited, but diners can also utilize the adjacent lounge area. Seating is limited, consisting of a large communal table, three four-tops and a row of wall-ledge seating with bar stools, although additional seating is available in the Cutlery Building's lobby, in the hallway just outside the restaurant. The overflow is necessary, as the restaurant's beverage selection, which includes the Korean liquor soju and South Korea's Hite beer, will make you want to linger a little longer than you would at a typical fast-casual spot. Anyone skeptical about the Landing should witness just how quickly those seats fill up during any given lunch or dinner service. The restaurant is positively bustling. In part, that's due to the reopening of the Arch grounds, which has made it easier to access the district from the monument. However, after tasting So's wonderful Korean-inspired cuisine, you might conclude that Kimchi Guys would be full even if diners had to traverse the Mississippi on handcrafted rafts to get there. Much of the menu is dedicated to well-executed versions of Korean Mexican fusion, like the "Korrito," which stuffs a burrito with earthy kimchi-fried rice and creamy street corn along with the protein of your choice. I chose the warmly spiced, succulent shrimp, which soaked up the soy, chile and fermented vegetable flavors that permeated the dish. The shellfish's texture is snappy, adding to the already pleasant texture of the al dente corn and crunchy fermented vegetables. 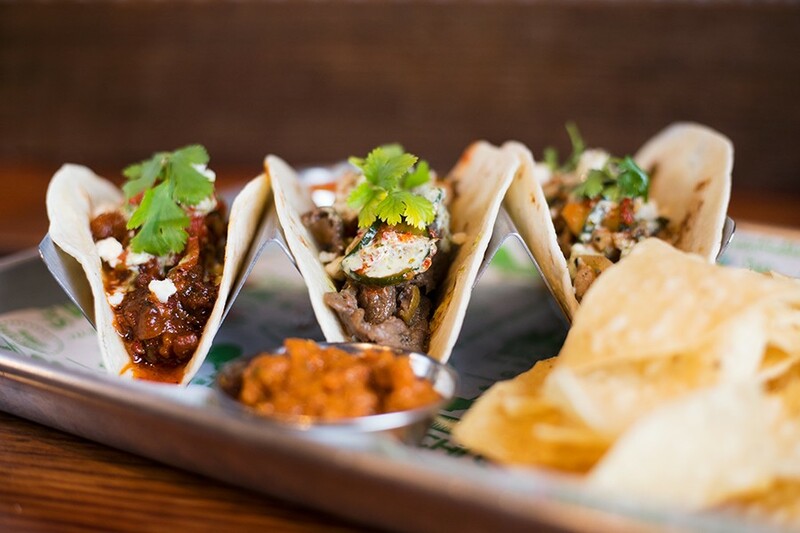 Tacos are topped with cucumber kimchi, cilantro, queso fresco and cilantro mayo. 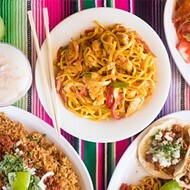 The "3 Takos Combo" gives diners a chance to sample three Korean-style meats, each wrapped in a miniature flour tortilla. With a subtle herbed sweetness, the succulent chicken is the most straightforward. The beef is bulgogi-adjacent — not as intense with sweet soy as is typical of the dish, but with those flavor undertones nonetheless. The standout, though, was the spicy pork, which paired the tender, juicy meat with hot Korean chile sauce. The contrast between the fiery meat and verdant coolness of the accompanying cilantro mayo was breathtaking. So further embraces Korean fusion with his sandwich offerings. A "Bulgogi Philly" subs in beef marinated in a garlicky brown-sugary soy for the standard chopped meat, resulting in an infinitely more flavorful sandwich. 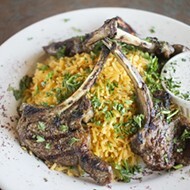 The meat's juices soak into the soft bread, mixing with molten provolone, seared onions and cilantro-kissed mayo. Piquant cucumber kimchi pickles cut through this richness, giving a burst of refreshment to the otherwise decadent dish. The "Kuban" is one of the best versions of the sandwich around. The "Kuban" is an equally stunning riff on a classic sandwich. For this Korean-Cuban mash-up, So pairs his spicy pork and bulgolgi-style beef with bacon that gives the dish a subtle hot and smoky backbeat. 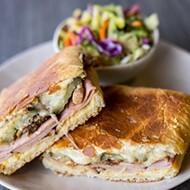 The meats are pressed with Swiss cheese, cucumber kimchi (a magnificent substitute for the traditional pickles), mustard and mayo onto crusty Cuban-style bread. The result is the best take on the quintessential sandwich that I have enjoyed in recent memory. The bibimbap bowl is topped with green onions, sesame seeds, sesame oil and a fried egg. Kimchi Guys does not rely solely on fusion. 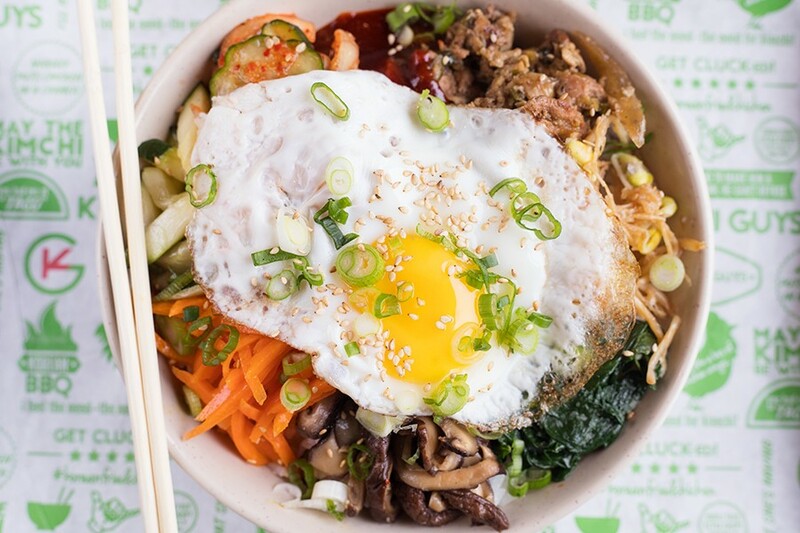 So's takes on traditional Korean fare are equally enjoyable, including the spicy pork bibimbap, a well-executed version of the classic egg, vegetable and kimchi rice bowl. 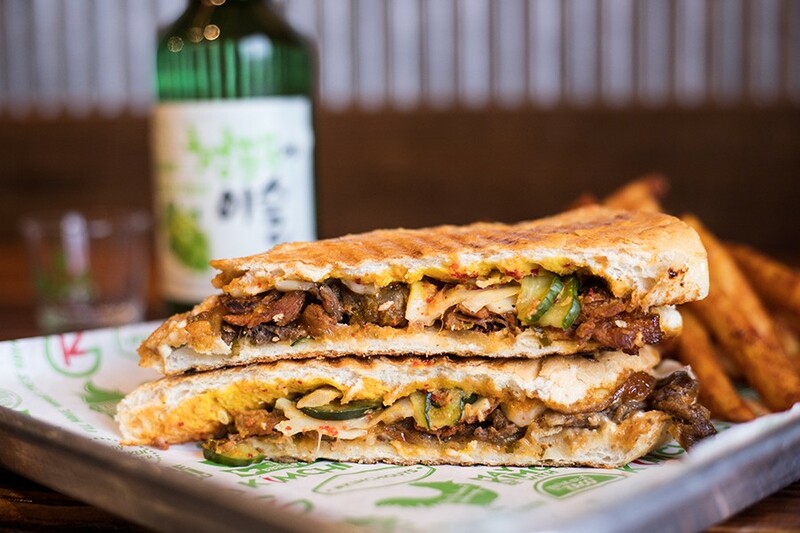 The restaurant also offers a vegan version, subbing in gochujang-tossed plant-based protein for meat. I missed the richness of the egg on the vegan rendition and wished for more of the spicy protein and fermented vegetables to make up for its absence. The flavors were there; I just wanted more of them. You can get the chicken in a three-piece combo with sides like potato salad and radish kimchi. 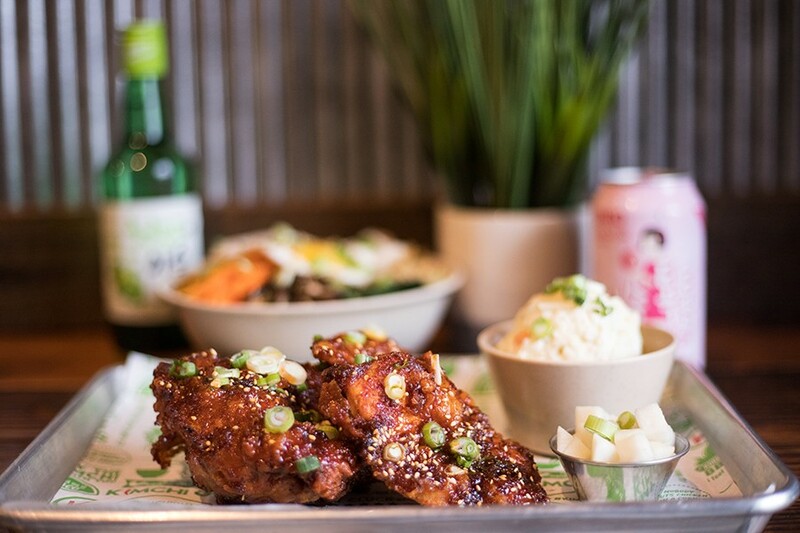 When it came to Kimchi Guys' signature Korean fried chicken, however, I wanted for nothing — except, perhaps, an endless supply. The meat is brined, battered and double-fried, which results in a thick layer of shockingly crispy breading. It acts almost like insulation, locking in the meat's juices while keeping the exterior crunchy. The chicken alone is perfection, but So doesn't stop there. Instead, he coats it in one of four sauces: a "Spicy Original" that has the earthy fire of Korean hot sauce; a "Korean Buffalo," which replaces the deep warmth of Korean chiles with the mouthwatering vinegar spice of Frank's Red Hot; a "Garlic Soy," which is delicate in texture but powerful with soy, sesame and garlic; and a "Honey Butter" so wonderfully rich and sweet you wish you had a biscuit to sop up its drippings after you pick every last morsel of meat from the bone. The only thing at Kimchi Guys more impressive than this fried chicken is So's endless optimism. Even three and a half years ago, when standing at the Cutlery Building meant looking at a pile of rubble and a dangling office chair, So could see enormous potential in what had become an unfashionable part of town. Today, basking in the beauty of that fried chicken after a sunny day at the Arch grounds, the rest of us can see it too. And boy, does it taste delicious. 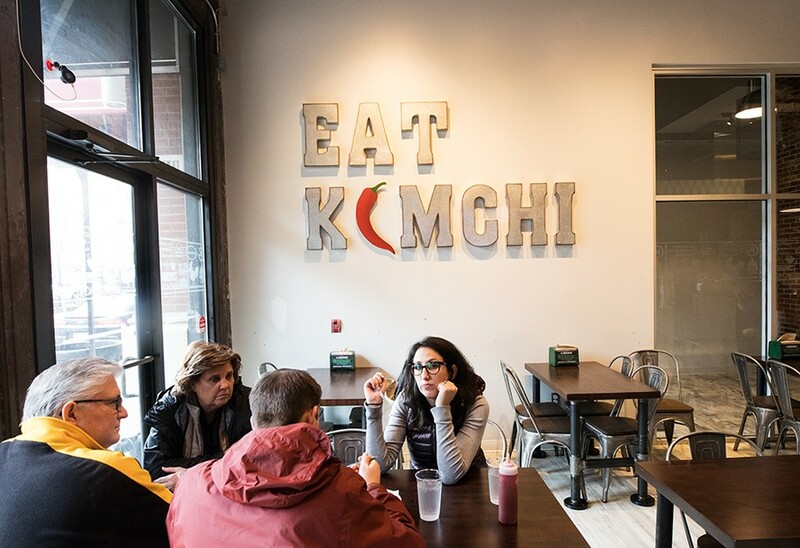 Kimchi Guys hopes to be part of the ongoing renaissance of Laclede's Landing.